This was one of the first objects donated to the Museum in 1992. It was found by Larry Keane while cutting turf by hand on the bog in Ahaneboy, near Knocknagoshel. Balls like this were made from a centre of matted cow hair and an interlaced cover of the plaited tail hair of a horse. 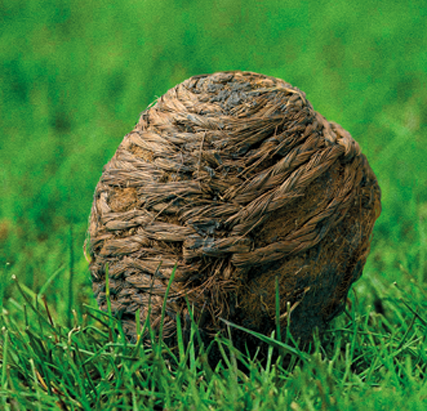 The finished ball was lighter than the modern day sliotar – a sliotar today weighs between 110 and 120 grams while the hair ball is around 50 grams. This would have made the game slower than today’s hurling. There are fourteen hair hurling balls in Irish museum collections, and the oldest dates from a period between 1157 and 1227, and the youngest is between 1663 and 1683. Ours is the third oldest in the country, dating from a period between 1278 and 1309. It is currently part of a touring exhibition developed by the National Museum of Ireland, which we will host in Spring 2015.